When the whole country gorges on junk food at the same time, upsetting things are bound to happen. The New England Patriots defeated the Seattle Seahawks in the 49th edition of the Super Bowl tonight, 28-24. The game was cool, but it’s no secret that the portion of the event that actually mattered was the world-champion level of nacho/wing/beer consumption that you exhibited. It’s also no secret that some friends are absolutely horrible cooks, whipping up trash dishes quicker than a Katy Perry wardrobe change. In fact, the culinary monstrosities of Thanksgiving are rivaled only by Super Bowl Sunday—think 7-layer dips that look like one of the layers is the remains of the kid from the Nationwide ad, and a lot of misguided attempts to make food look like footballs. Don’t shoot the messenger, but we’re throwing numerous penalty flags on these #StrugglePlate concoctions. You decide. We think it’s guacamole, but pass that dip a water bottle because it looks dehydrated af. Nice try, Trent and Jesse’s mom. Especially when it is destined for the dump. While we see the reasoning with incorporating a corn tortilla, it just seems like this never should have happened. Not on this day. This is the pizza equivalent of that guy on your company’s flag football team who tries way too hard. “Got that buffalo chicken-sushi game on fleek.” Don’t be surprised if next year’s Paperless Post invite gets lost in the ether. And chicken nuggets can be cupcake toppings—if you’re kitchen is the epicenter of struggle, that is. We feel for @KupKayk89 because no Super Bowl Sunday should ever be spent nibbling on Lunchables. No surprise that this is the worst. #StrugglePlates Can Happen On The Field, Too. Skittles in a Tupperware container? 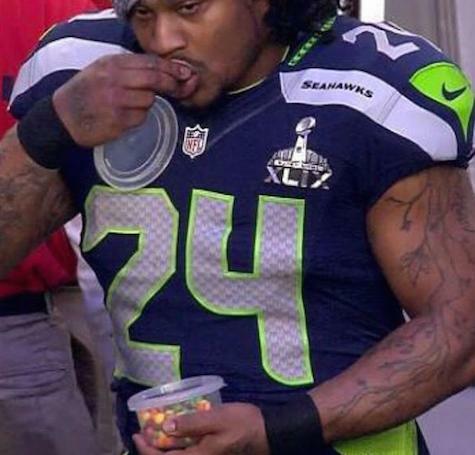 For shame, Marshawn.